A denture is a removable dental appliance that is a replacement for missing teeth and the surrounding tissue. Crosspoint Family Dental has the experience and practice to ensure the right dentures are fit for you in the Billerica, MA area. Dentures are made to closely resemble your natural teeth and may even enhance your smile. There are two types of dentures available. These include complete and partial dentures. Complete dentures are used with all of your natural teeth are missing, while partial dentures are used with some natural teeth remain. A partial denture fills the spaces of missing teeth but also prevents the remaining natural teeth from shifting. Complete – Complete dentures can either be conventional or immediate. Conventional dentures are made after your teeth have been removed and the gum tissue has begun to heal. It will be ready for placement in the mouth about 8-12 weeks after teeth have been removed. Immediate dentures are made in advance and can be positioned as soon as your teeth are removed. Although you are not without during the healing period following tooth removal, these may require more adjustments to fit properly. These are considered a temporary solution until conventional dentures can be made. Partial – A removable partial denture or bridge usually consist of replacement teeth that are connected to a base that matches your gums, which is connected by metal to hold it in place in your mouth. The process of receiving dentures requires several appointments, usually over several weeks. 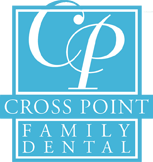 Crosspoint Family Dental understands that not everyone loves going to the dentist. We have created a warm, comforting environment to help ease any fear or discomfort you may be feeling. Dr. Peyskhov and Dr. Turkenich each have over thirty years of experience are available to get you started with dentures in the Billerica, MA area.